← I’ve been tagged for eight "randoms"
This is an image of the aftermath of two galaxies colliding in the constellation of Ursa Major. The galaxies are some 500 million light years away from us. 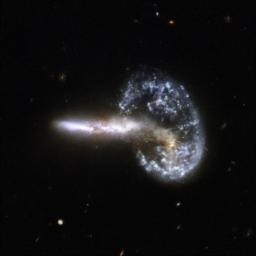 The collision between the two galaxies produced a shockwave that first drew matter into the center and then caused it to propagate outwards in a ring. This image is part of a large collection of 59 images of merging galaxies taken by the Hubble Space Telescope and released on the 18th anniversary of Hubble’s launch. JPL posts "Galaxies Gone Wild!" with a number of cool images and statistics.